Silent Auction organizing committee members are, from left, Chris Phelps, Paul Waldsmith, Jill Steinmetz, Greg Hower, Chelsea Richardson, Sonya Stonerock, Polly Long, Mike Henson and Beth Harrigan. 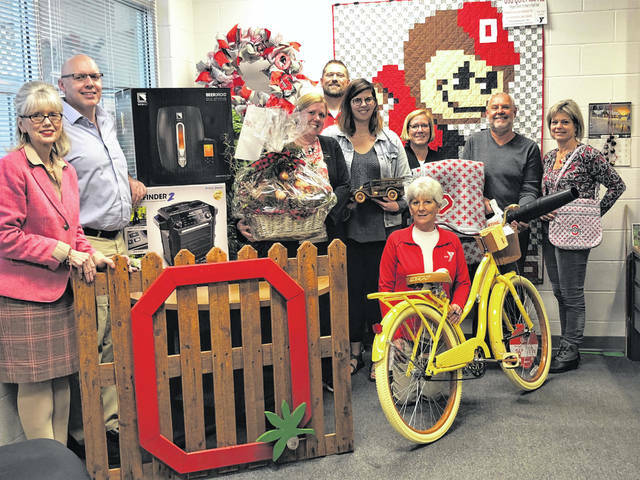 They are shown with a few premium auction items, as well as a custom OSU-themed quilt valued at $400 that will be raffled at the conclusion the auction. The Champaign Family YMCA’s annual Invest in Youth Silent Auction began Nov. 23 and continues until 5 p.m. Dec. 3. The public can view and bid on items that include gift baskets, sports memorabilia and tickets, toys and games, handmade goods and more. It’s free to get a bid number. This year, the auction will coincide with the Y’s Christmas Community Family Night 5-8 p.m. Dec. 1. All are welcome to this free community event. Peruse auction items and take part in the Christmas festivities. A custom OSU-themed quilt (valued at $400) will be raffled off at the conclusion the auction period. Tickets for the raffle cost $5 each or six for $20 and can be purchased at the Y Welcome Center on Community Drive. The auction is an opportunity to get a jump-start on holiday shopping while supporting a cause. Every dollar raised by the auction goes directly toward providing YMCA memberships for deserving families and youths in the community. As a result of the auction and the generosity of the community, the Y provides financial assistance to over 300 Champaign County residents each year. The Y expressed appreciation to the individuals, organizations and businesses that donated to this year’s auction.